City health officials are raging mad at the latest party snack to hit the club scene. "I'm utterly baffled by the fact that none of these party promoters or club owners have been arrested yet" says Dr. Jonathan Livingstone. "Used condoms aren't a party food. They're not a snack. They're hazardous, and anyone stupid enough to eat one is liable to catch an STD." Edible used condoms are a culinary fad that owe their existence to Thierry Desrochers, the owner of Little Italy's Lolana Nightclub. "I got the idea from a dream," says Thierry. "I was a participant on a reality cooking show, and was told that I had to cook a meal with nothing but used condoms. And I did, and it tasted amazing. When I woke up, I knew I had to try cooking the dish in real life, so I rubbed one out inside a trojan. I then sautéed the used condom in peanut sauce, and it was just as tasty in the flesh as it was in my dream." It wasn't long before Thierry was offering his chewy concoctions to patrons of his nightclub. "My used condoms were so popular with my customers, that other clubs started offering their own used condom treats." These days, it's almost impossible to visit a party in Montreal without finding a bowl full of crispy used condoms for sale. "And it's not just condoms in peanut sauce either, there's all sorts of dishes being made with them now," says Thierry. This rebellious streak doesn't impress Dr. Livingstone. 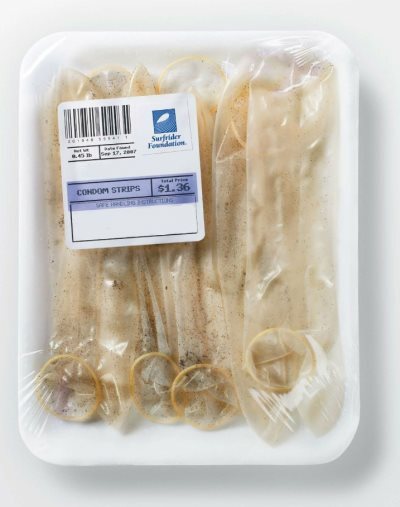 "I don't care what the rationale for eating them is, a used condom isn't sanitary, no matter how well it's cooked." Thierry, however, disagrees. "I don't care what the doctors say -- a well cooked condom is perfectly safe to eat. If anyone tries to stop me from selling my culinary creations, I'm going to fight them all the way to Canada's Supreme Court," says Thierry. "I only serve adults at my establishment, and if they want to eat used condoms, that's their business. Their stomachs don't belong to the government, and they certainly don't belong to Dr. Livingstone."